The place where I get most of my frames and the mats cut, had a nice sale a week ago and as I had a voucher as well, I went and had a custom frame made for the Northern Lights sampler which I finished back in January. It is a bit of an unusable size (though, after I got the frame home, I discovered that the frame for the Legends of the Dragons is almost the same size) and we debaded a while if I should have a mat or not, but in the end we decided not to have one. I brought the frame home on Friday and imidiately went on putting the whole thing together. The there was the part where I had to decide where to hang it. The space I first thought about didn't work, so now it found a home in the little corner next to the window where I have my stitching corner. The picture is a bit on the smalish side, I know. With a double click, you shoudl get a bigger picture. 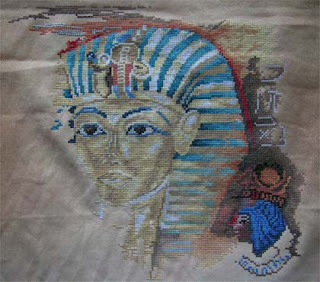 As I was actually at home last week (having a training in our home office) and not at a hotel somewhere, I've made quite a bit of progress on King Tut. At the moment I'm working on the lady in the the right hand corner. All in all think it's about 35 ~ 40% done. 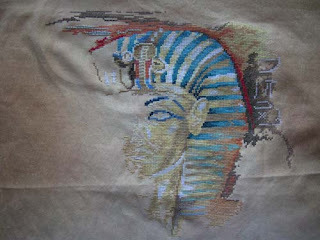 At the moment I really enjoy stitching him - I love the colors and how the whole picture is done. 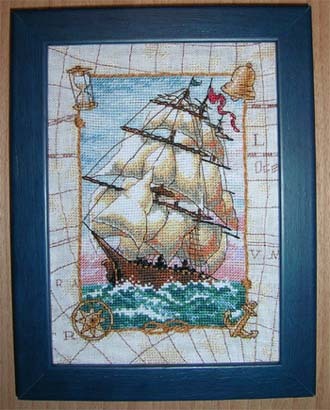 I've ordered the Kreinik that will replace the gold thread that was in the kit - have to see when it will arrive. Next week the light house will get some attention again. Here a little (very little actually - it's about one inch across) thing I've also made last week. 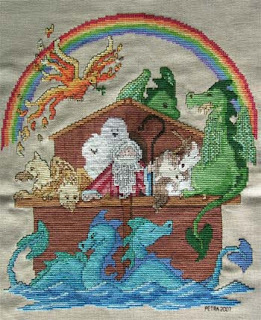 I was doodling a bit in the training and then decided that I should try and convert it into a cross stitch pattern. Ah, almost forgot, the LotR symphony was quite impressive, really. A large orchestra, three choirs (boys, women and men - around 40 people each) and the drawings of Alan Lee. I really liked it and it was a wonderful experience. Only 'complain' I've had was the fact that because I know the soundtracks of the movies so well, I did spot a few (really only a few) not quite perfect notes in the brass section. And the men's choir fell a bit short on the choir used in the the films. The boys soloists (they had two), on the other hand, were really good and the soprano soloist was very good - I liked her version of 'Into the West' better than the one from Annie Lennox. Tonight I'm going out to see the Lord of the Rings Symphony in the Jahrhunderthalle in Frankfurt. I've saw that this event was on when I went to something else with my parents after Christmas and we got our ticket pretty soon after. The tickets we got are actually some left over tickets - the show was pretty much sold out by then. We didn't know that they would go and schedule a second concert the same day (at 3pm) - we might have gotten better seats there. Quite a few things have happened last week. I found out that I'm going to Japan for a week in three weeks. I decided to buy a new camera and use the voucher I've got from the company for 10years for it - got a pretty sweet deal, really. I've got some trouble with my credit card - I need to call the bank to find out what the problem is. My own pattern, a simple knit 3 purl 3 with a shift every four rows (one direction in one sock, the other direction in the other sock). 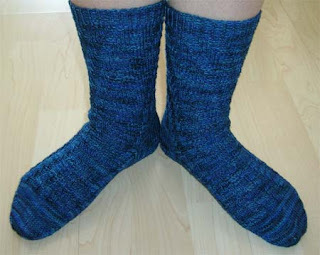 The wool is Wollmeise Sockenwolle in the color 'Gewitterhimmel'. 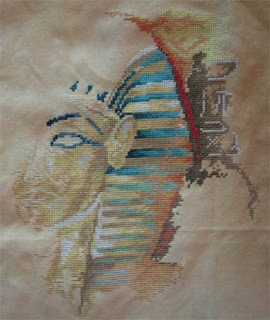 And I made some good progress on King Tut since last week. 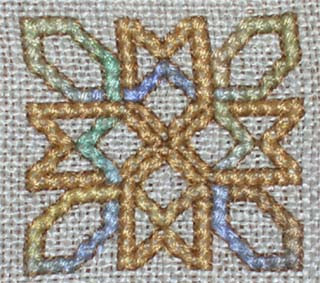 I've started with the gold bit (upper left), but there's never enough gold in the kit to stitch all of it - so I ripped it out and subbed it for Kneinik 102 braid I've got in my stash. A pretty good match to the gold in the kit, but I don't think I have not enough of it either. I have to see how far I get. And, last but not least, I've went a saw '300' - I was reluctant at first, as it is a pretty violent picture, and I've read a lot about about controversity how the Persians are shown. But, with this in mind (it is the addaptation of a graphic noval after all), I did enjoy it in the end. And I was very pleased about the part David Wenham got to play (I've liked him a lot in Lord of the Rings) - I didn't know it was to be so large. 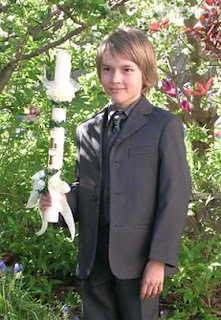 My middle nephew went today to his first communion. So the whole family (except my sister in Sweden) and friends came together to celebrate this event. In the restaurant we sat out in the garden and after a while everybody started to search for the shade - it's the middle of April, but it was already over 27°C (80°F). If this isn't global warming I don't know what is. It is certainly not normal for April. 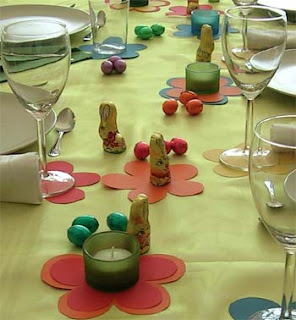 The Easter feast I've prepared for the family went well and (at least I didn't hear anything different) everybody enjoyed the food. So, gotta run. Still need to pack for the next couple of days and I haven't watered the plants yet. Next thing is to get is framed and then find a nice place for it. At the moment I've got no clear idea where to put it. Even though it's a long weekend and I should be working on my 'at home' project (aka King Tut) I've staying with the lighthouse. Just more in the mood for it, I guess. Easter weekend (btw, happy easter to everybody) I'm enjoying the time off and use it to do a hundred little things around my place. Fun things like finishing my photo album from New Zealand (hey, it's been only two years I've been there) and less fun things like window cleaning. 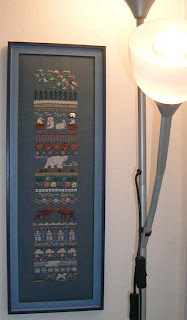 The pattern is from Knitty (where else) . 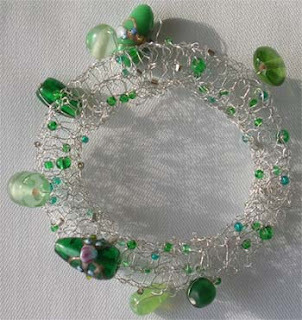 I've used silver wire and some larger beads I've found in Dresden last week. The seed beads I've got in my stash. Other then that the week was pretty un-exciting. Work, some more work, and, yep, work.